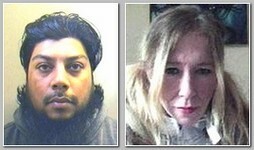 Details of new plots, to be executed in UK in the near future, were revealed in messages from former computer hacker Junaid Hussain, a 21-year-old from Birmingham, and Saily Jones, 45, a former punk from Chatham in Kent., an unemployed mother-of-two from former relationship, who joined ISIS in Syria by the end 2013. according to British sources reported on 08/11/2015. Junaid Hussain was at the time the leader of a shadowy computer hacking group known as Team Poison. After the pair starting exchanging messages online, Saily Jones seems to have become radicalised and later claimed Britain and America were ‘terrorist’ nations. Junaid Hussain runs the I.S.I.S recruitment arm in the terror group’s de facto capital of Raqqa in Syria and is a top-five target for the U.S. Secret Service. Saily Jones is working alongside her husband in Raqqa recruiting female militants. The pair repeatedly being caught trying to incite carnage – told undercover reporters posing as wannabe jihadis to carry out so-called ‘Lone Wolf’ attacks in Britain and even sent them bomb-making guidebooks. The militants also revealed that the Queen and the Royal Family would be targeted with Boston Bombings style pressure cooker bombs Saturday -8/14/2015 VJ commemorations (Victory over Japan day ). In a series of conversations on encrypted messaging sites over a four months, the reporters convinced Jones that they wanted to make a bomb. Saily Jones then gave detailed instructions on how to construct a pressure cooker explosive and insisted on seeing receipts to prove they had bought the materials. She revealed she had another potential bomber in Scotland and two others who had so far failed to carry out attacks and urged the undercover reporters to start a gang themselves. One reporter later travelled to the Turkish city of Urfa near the Syrian border to meet an ISIS security chief tasked with looking after foreign jihadists while they underwent terror training. He claimed four or five recruits were British who had returned to Britain to carry out an attack. Another terror chief has meanwhile claimed that four or five British recruits who trained in Syria have now returned to Britain to launch strikes. * According to media reports, based on USA Intelligence sources, on 08/27/2015, Junaid Hussain, who U.S. and European officials said became a top cyber expert for Islamic State was killed in the last days by an American UAV missiles strike .